Hey guys, remember when I ran that duathlon over two weeks ago? I’m sad to report that no pictures were posted (really really sad) so I’m finally ready to post my recap. Enjoy! I’ll be honest- I had no idea what I was getting myself into with this duathlon. I don’t even remember how I stumbled upon it in the first place. But I can truly say I am oh so happy that I did. After a long day on Saturday, I got home from work later than I wanted to and feeling less than swell. The changing weather was making all my injuries act up and my stomach had been bothering me. All the confidence I had built up with my first and only Brick the previous weekend had gone out the window. I found myself hoping for terrible weather so the event could just be cancelled. Certainly not the best pre-race attitude. Luckily I slept pretty well and woke up easily at the crazy time of 5a on Sunday morning. The weather forecast looked superb (clear and upper 60s) and I knew I had no excuse. My stomach was still grumbling but I stuck with what I knew and ate my typical toast+PB2+banana but skipped the coffee and drank watered down vitamin water instead. K. promised that a B vitamin supplement would give me a little extra oomph so I took one of those too- any little bit would help! We arrived at the trail head just after 7a and I was quick to notice just how small the race was, 80 people max, which was a huge change of pace from every other race I’ve done. My friend H. and I checked in and were assigned our transition spots (which were right next to each other) so we went to get settled in. Our transition prep was literally just racking our bikes and setting our helmets on the seat, nice and easy. We hung out and tried to quell our nerves while we waited to start. We decided to walk the start of the trail to get an idea of what we were about to face and this is where the fear set in. About a tenth of a mile in there was a STEEP decline that was basically a mudslide. I instantly dropped any goals I had for the race and made a new one: don’t get hurt! This was going to be interesting. When the air horn signaled my start I darted into the woods. I tried to settle into a comfortable pace but as soon as I saw that decline again I slowed myself and eased my way down. By a quarter of a mile I was seriously huffing and puffing and it really hit me just how hard trail running is. After a few ups and downs there was a nice straight stretch (on the edge of what felt like a mountain!) so I picked up some speed and started chasing down some folks. I expected my bike time to be slower and even though I wasn’t really trail trained I knew I could make up some speed with the run. The long course athletes were on their way back as I was hitting the half way mark. Every single person who passed me offered up words of encouragement- even the athletes who were out there REALLY trying to win. “Keep it up!”, “Great job!”, “Half way there, good work”. It was all so genuine and made me fall in love with the small race atmosphere. For most of the run I was just a few steps behind a guy and when we came to an abrupt slippery incline he stopped and reached out his hand to help me. Amazing! Without all those words of encouragement I would have been done for- I was already fighting thoughts of pulling out of the rest of it because I felt so unprepared. Despite how hard it was the run went by pretty quickly. I made the decision to race without music and I’m so glad I did. The trail was beautiful and I was happy to cheer on the people I passed by just as others had done for me. There was a volunteer with water at the turn around mark and I was happy to see him. I stopped and downed a cup of water before processing the fact that I had to run back the way I came (and then do it all again after a bike ride…). On the way back I nearly lost a shoe is a mud pit but overall I came out of the woods unscathed and excited to ride. I was so happy to be on the bike, which is something I never thought would happen. The breeze felt awesome and the area we were in was so serene. The 12 mile ride was a big rectangle with right turns only which made it nice and easy. While on the bike I focused on my cadence. K. had hooked up a little computer to show me my current pace and cadence. I was aiming for 85 to 90 rotations and it was so helpful to see it and shift my gears accordingly. I felt like I was flying on the bike! My max speed was 24.9mph (on a downhill, obviously) which is CRAZY fast for me. Prior to this my max was 18, just for reference. Thanks to staggered starts I was pretty much alone out there on the ride, I think I only came across maybe a dozen riders the entire time I was out. The second half of the ride was hilly and my speedy first half pace was starting to catch up with me, but just like on the run anyone who passed me by was nothing but supportive. I powered through and was very proud of my bike performance overall. Transition 2 was a bit rough on the legs. When I dismounted I nearly collapsed, my spaghetti legs didn’t know what to do but I just kept moving. As soon as I got onto the trail I hit a water stop and took a few seconds to shake out my legs and drink some water. At this point I felt pretty destroyed and knew that run #2 would be a lot more walking that running. As soon as I saw the state of the trail I was even more certain about that. What had been just slightly muddy before was now pretty out of control. The smaller pits looked big enough to host mud wrestling matches. They had added more volunteers for the second run who were equipped with water and stationed at the more treacherous parts of the course to give you a bit of warning. Run two was honestly a huge blur. I knew that my tired legs only made the course more dangerous so I was extra cautious, I was so close to being done that I didn’t want twist an ankle now. I tried to give it a little extra at the finish line but there was very little to give, haha. It felt so amazing to cross that finish line. My super secret goal was a 1:30, but that was before I understood trail running. I was nothing but pleased with my finish time. Despite the fact that I wanted to collapse I stayed upright and moving. My calves + achilles were KILLING me so there was lots of stretching. 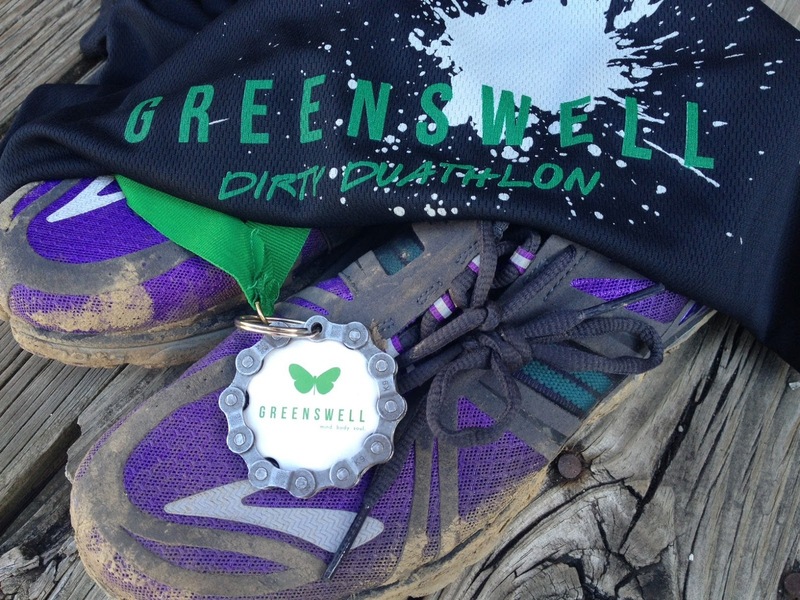 Greenswell did an AMAZING job with the post-race amenities. Bottles of water, tons of bananas, boxes full of Cliff bars, a giant pitcher of Gatorade! One of the sponsors was there with free sunglasses. Anything you could need! I had done a terrible job of fueling (one shot blok and a bottle of water made with Skratch ) and needed food in me instantly and a Cliff bar really hit the spot. The medal was also quite neat- simple but a nice touch with the bike chain. This was definitely my favorite race of all time and I am totally hooked on multi-sport events. I feel like I really fell in love with cycling when I was just out there on the open road alone (yes, I realize how corny that sounds). I’m more motivated than ever to start swimming and get myself into triathlons in the near future. I also can’t say enough good things about Greenswell. I definitely plan on keeping an eye on their race calendar and joining in on some of their training rides/runs and clinics.